David P. Flores enjoys creating art as an urban artist or street artist, and as a painter. He does not note the difference since all it takes is to create. He truly enjoys the street art movement since it allows individuals to speak their opinions out. These opinions can be expressed in any form of art, dance, and poetry. David P. Flores enjoys his freedom and meeting interesting people in every step of his way. David Flores is best known for his self-proclaimed "stained glass" and mosaic style. These images are often famous iconic images and he enjoys participating with a variety of companies to perform his work. Some of these opportunities have led to great collaborations such as working with Shepard Fairey, Stüssy, and Kidrobot. David Flores’s Stained Glass style was developed while he was working at Deluxe Distribution; he was sitting around making comics with Mark Gonzales. Out of nowhere, David Flores began to outline people’s faces, cars, trains, and everything else. From that moment, this idea of interpreting lighting in an illustrative fashion simply stuck. His work has never been influenced directly by other artists because David Flores has always worked alone. Yet, David Flores art is highly influential. 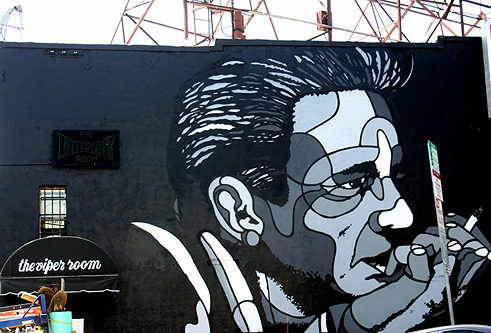 The world-famous Viper Room (also known as Johnny Depp’s joint) is situated in the heart of the Sunset Strip. This intimate nightclub is styled in the fashion of Harlem's great jazz clubs of the 1920's and since its stellar opening in 1993, has hosted the likes of Johnny Cash, Tom Petty and the Heartbreakers, Stone Temple Pilots, Bruce Springsteen, Oasis, Queens of The Stone Age, Courtney Love, Natalie Cole, Elvis Costello, Pete Yorn, Lenny Kravitz, Pearl Jam, The Strokes, Weezer, Maroon 5, John Mayer, Iggy Pop and Sheryl Crow, as well as an array of other internationally established artists and the cult favorites of America's underground.